Every organism contains an array of traits - called DNA, when 2 parents mate they produce a child containing a mixture of their DNA. Depending on how well those traits work together to help the child survive so that he may reproduce, will determine if those traits will pass into future generation. Rarely a random trait enters a child's DNA that was not inherited from the parents, we call this mutation. If the mutation is beneficial, the organism will survive long enough to carry the mutation over to future generations. So the cycle continues, after many generations we continue to optimize the population by "mixing and matching", "trial and error" of DNA. Genetic Algorithms are used to find optimal solution by method of evolution-inspired search and optimization; Generally used in problems where linear/brute-force searches are not viable in terms of time, such as – Travelling Salesman Problem, Timetable Scheduling, Finding Neural Network Weights, Sudoku, Trees(data-structure) etc.. The first requirement is a encoding scheme suitable for representing individuals, second requirement being a evaluation function for representing the fitness of an individual. Notes: Research indicates Gray Coding being more efficient in terms of binary encoding. Trees can be array encoded, will add graphic shortly. 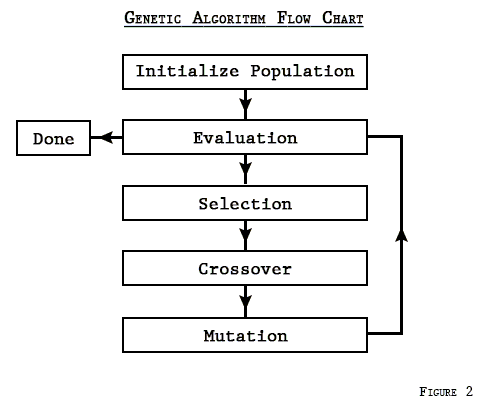 Below is a flow diagram of the Genetic Algorithm, we will be doing a step by step walk-through of this process. The population is initialized by randomly generating a collection of DNA samples. The size of the population depends on the size of the problems search space, and the computational time it takes to evaluate each individual. Most of the time you will be dealing in population counts of about 50 up-to a 1000. The evaluation function determines the fitness of an individual. This is the most important part to the Genetic algorithm, if this function is flawed, the algorithm will not produce results. The evaluation function should not return a Boolean(true/false) value, it has to be a comparable result. If individuals are able to be sorted from fittest to weakest, it is a viable evaluation function. For evaluating distances between cities you may return the total distance traveled as a fitness score. For a classifier you can return the number of correct classifications. You could use probability as a score assignment, of how likely an individual is a solution. Selection is where we will be choosing the parents for mating. Selection happens for each child in the new population. There are three type of parent selection methods, Fitness Proportionate Selection, Tournament Selection, and Truncation Selection. A viable option is to carry over selected individuals to the next generation. Fitness Proportionate Selection: Also known as Roulette wheel selection, is a method of selecting individuals based on its probability of being selected. Sort the population from weakest to fittest, generate a random number within the range of the sum of the populations fitness, iterating through the sorted population, summing each individuals score up until it either equals the random number, or is greater than the random number. That individual is then selected as a parent. This method can take a long time to produce results and is used for maximizing a function. Tournament Selection: Selecting the top performer to carry over to the next generation, and to mate with the rest of the population. Truncation Selection: Choose a percentage of fittest individuals to mate with the population or amongst each other. Carrying over selected individuals is optional. Once you have your selected individual(s) also known as the parents, we need to mix and match their DNA to produce a new population of children. We call this process Crossover. When using fitness proportionate Selection, you will select a new parent for every individual in the population. Tournament Selection, You mate the selected parent with every individual in the population. Truncation selection, you could randomly select from the winning group, or use fitness proportionate selection on the winning list to mate with every individual in the population. 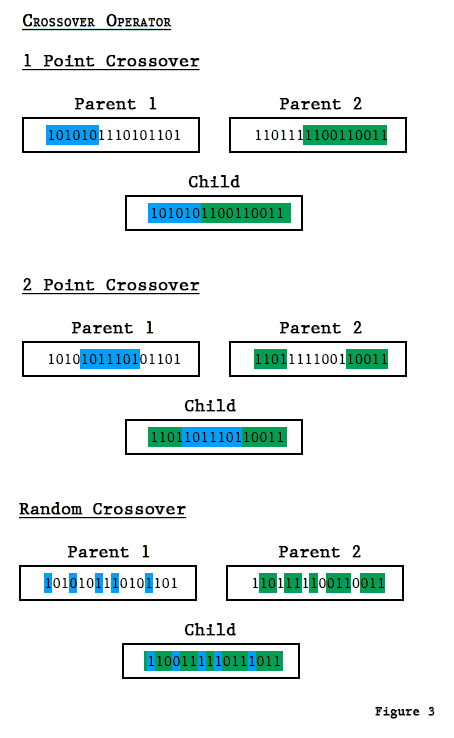 There are 3 ways to crossover two DNA arrays. 1 point crossover, 2 point crossover, random crossover. Mutation allows the algorithm to introduce diversity into the population, expanding the opportunity to search unexplored areas in the search space for fitter solutions. Mutation is implemented by giving each element in the DNA array a probability of 2-5% of being randomly altered. The mutation procedure is called for every child. After the generating a new generation, we go back to the evaluation step. After the Evaluation step, we can either stop; from finding the most optimal solution, generation is not progressing(evolving) in fitness, or where time is a factor. Note: Example algorithm is on its way. This is only a draft, and will be improved. I can't believe that these work even though evolution isn't real. Are there any good algorithms based on Creationism? You seem to be implying that "you" are God. Great article. I would like to see more details about the benefits and costs of some of the options available. e.g. When to use which parent selection approach, benefits or 1-point, 2-point, and random crossover, etc. If you are truly l33t then you use a genetic algorithm to breed genetic algorithms (adjusting crossover probability, mutation etc) to find the answer. What about an algorithm to breed algorithms that breed algorithms? I think, a better idea would be an algorithm that breed algorithms that breed algorithms that breed algorithms. GAs are very good in traversing different parts of the solution space rather quickly; if you combine them with local optimisation methods to weed out illegal or non-optimal solutions you can really enhance the speed with which (more or less...) optimal solutions are found. Regarding the question above (differences between 1,..,n-point crossover, random, mutation frequency etc. one of the key problems is finding the best configuration for the problem at hand... in fact, one might even try to use another GA just to find a good setting. Unfortunately, some solution which is good for question A might yield really bad results for question B. The article about NSGA-II ( http://www.iitk.ac.in/kangal/Deb_NSGA-II.pdf , this might be outdated but is a good read nevertheless) contains some really good ideas about this topic and is a good example for a rather sophisticated GA.
No need to post that comment about a domain name. Just a suggestion. So you don't end up investing a lot of time in a website you don't control. the four letters A, C, G, and T, are really two symmetrical ones. thats what list to int country means...maybe. It might be easier to understand if the biological process that each stage is mimicking is briefly described in each step. That might help pull out points such as if you place functionally related 'genes' on your 'chromosome' close to each other and adopt a single or 2-point crossover, then they will be likely to move together, i.e. display a degree of linkage in each generation. how to implement travelling salesman with the help of genetic algorithm? Human activity evolves in predictable yet unpredictable patterns. This mutation and feedback model could one day predict all behavioral activity of the human race. Careful substitution of values would give scientists some interesting probabilities. This is being done already.